An anointed vessel of God called for such a time as this to minister to the body of Christ, Lady Linda L. Carlton “Lady” as she is affectionately called, is the wife of Bishop Rudy V. Carlton, who serves as Founder and Senior Pastor of the Jehovah-Jireh Praise & Worship Church Center, Newark, New Jersey. Bishop and Lady Carlton met, fell in love fifty years ago, and have been married for forty-five blissful years. Lady Carlton is the mother of three adult married children, Shari L. Cooper (Raymond), Tyrone (Juanita), and Randy T. (Danielle). Shari serves as the Overseer of Music, Worship & Arts Ministry, while both Tyrone and Randy serve as Associate Ministers at Jehovah-Jireh PWCC with Elder Randy serving as JJPWCC’s Youth Pastor. Together Bishop and Lady Carlton celebrate knowing that the Lord has graciously increased their family, blessing them with a total of Thirteen Grandchildren, Three Great Grand-Daughters, two Great-Grandsons, Three God-daughters and one Godson. For Twenty-Nine years, Lady Carlton continues to walk alongside, support and assist her husband in Full-Time Ministry. She serves as Overseer of the Jehovah-Jireh Praise & Worship Church Center, Daughters of the Promise Women’s Ministry, Church School Ministry Teacher, and is a faithful member of the Abatenjwa Alliance Minister’s Wives and Minister’s Widows of Newark & Vicinity. 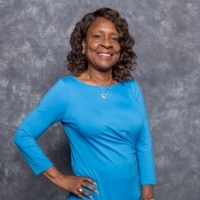 Born the second child of eleven, her parents, the Late Junior and Mable Eaddy were instrumental in contributing to her leadership and life skills. An Alumnus of the Newark Public School District, Lady Carlton successfully earned her credentials as an Certified Early Childhood Development Teacher. Of her many accomplishments as a wife, mother, grandmother, great-grandmother, godmother, sister, friend and leader, the one thing standing out is her most notable way of releasing “Words of Wisdom” for her Inspirational Moments during Sunday Morning Worship, at which time she ministers to the heart of the total man in which the men, women, and children all benefit. Standing on the word of God, Lady Carlton’s confidence in His Word is unyielding and her favorite scripture is the First Division of Psalm.